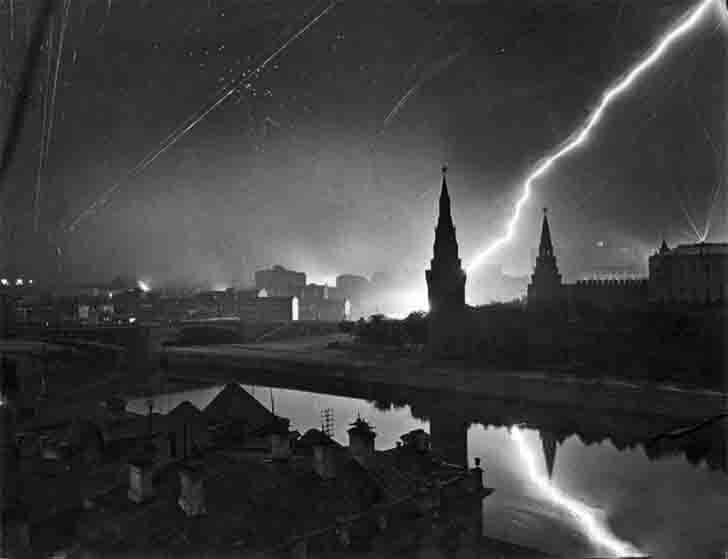 Air raid of bombers Lyuftvafe to Moscow on the night of July 26, 1941. Thin glowing track – work of the Soviet air defense, a thick white line – German parachute flares to illuminate the area for applying and adjusting air strikes (due to the large exposure when photographing tracks merged into a single line). Pictured Moscow River, Kremlin Embankment Kremlin Vodovzvodnaya Borovitskaya and towers, the Big Stone Bridge.